Drum Dyed Veg Strip Colored Leather Strips made from 9-10 oz drum dyed, vegetable tanned leather. Strips available in our standard length and range from 60" to 72". Perfect for projects that require pre-cut pre-dyed strips. Suggested uses are leather belts, guitar straps, rifle slings, luggage straps and more. No snaps attached. Width indicates buckle size needed. 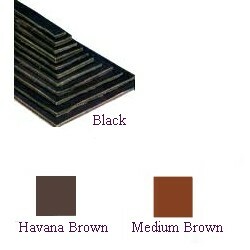 Your choice of 3 colors Black, Med Brown & Havana. All leather strips are cut per order. There is a 25% restocking fee on all strips if returned, unless they are defective or shipped incorrectly by Zack White Leather Co. There are no exceptions.